Hi there, Layle with you today for another round of Pick a Card, Any Card! Each month, 5 of our design team members and I will be picking one of our favorite Simple Stories or SN@P! 3x4 or 4x6 cards and sharing them with you - in more ways than one! We've introduced so many GREAT cards over the last few years that I thought it would be fun to share some of our favorite cards each month, tell you why they're our favorites and then give you a chance to win not only the specific cards that we picked, but the other cards they're paired up with as part of the set (more on that fun giveaway at the end of this post)! If you missed last month's picks, you can see them here. I don't consider myself a trendy scrapbooker, but I have to say, I really love all the chalkboard style scrapbooking items that are popular right now. And how appropriate that they would be included in the new Smarty Pants collection! I find this particular card so cute because of its cursive font (in the exact style I learned as a child) and the three little apples sitting in a row on the bottom. I will definitely find a way to use it on a layout sometime this school year. We can't wait to see how you use this card in a layout, Donna! This is one of my all time favorite quotes. It's one that everyone should live by. One reason I love the SN@P! cards is because of the everyday life quotes that we all can relate to. These can be used in so many different types of projects. This one in particular, I have on a colorful canvas hanging in my office to look at every day. Emily is right - if you haven't checked out the SN@P! Life cards with their great quotes, you should! I love cards with a banner printed right on them that I can layer up! I love adding more strips, thread or stitching, chipboard shapes/stickers right over the top to add dimension! And I love the blank cards that I can add a photo, journaling or title on! Like Gail, I love cards that have empty space on them for adding photos, and especially journaling, and this card is perfect for that! I love the fact that some of the 4x6 SN@P! Cards can be used as titles. The fonts and graphics on the cards are big enough to use as a title. The Sn@p cards have to be my favorite cards Simple Stories has put out. I love this card because of the fun way the title is displayed, all of the bright colors and the title is perfect for a lot of my photos. LIFE, and this card, are pretty amazing (don't you think?)! The quote is from one of my absolutely favorite Christmas movies, Elf. I make sure to watch it several times over the holidays. The card would be perfect with a photo of my family watching the movie this year. So, what do you think? How about those picks - pretty fun, right?! If you haven't quite jumped on the pocket page style of scrapbooking and are scratching your head trying to figure out how to incorporate all of our fantastic 3x4 and 4x6 card designs into your traditional scrapbooking, no worries, I'm here to help! I'll be tackling this VERY subject for True Scrap 5 - an online, LIVE virtual scrapbooking event October 11th and 12th, with inspiration and education from 15 A-list instructors including Heidi Swapp, Nichol Magouirk, Jennifer Gallacher, Tammy Tutterow and more! Click HERE to learn more about this great virtual event, including the list of instructors, their class descriptions, more about my class (I'll be covering 9 different project ideas and examples for incorporating 3x4 and 4x6 cards in your traditional scrapbooking!) and to register. Regular registration for this online event is $197, but if you register by September 30th, I've got a special discount code for you, saving you $50 off when you register! Just follow this link, register and type in the code LUCKY50. Hope to see you (virtually) there! WOW! That's a lot of card goodness if I do say so myself. Good luck! By now you all have seen how great Say Cheese is for Disney themed pages and albums (seriously, could it be any cuter?). My family hasn't had the chance to make it there yet, but today I'm going to show you how well it works for other things, like the cut-rate mouse who operates in an arcade. You know who I'm talking about, right? My son had a blast at this place! When you're three, you don't know what you're missing, right? Anyway, this line has the cutest color scheme that is well suited for just about everything. I set off one of the busier prints with a few pieces of the Say Cheese Basics. I also focused on the camera elements in this line, such as this adorable sticker. I like to pop stickers up with dimensional adhesive for some extra oomph and then I used some of the smaller stickers and chipboard pieces to create an embellishment cluster. My journaling is on Sn@p! card that I cut down to size. It is made for a list, but it works for a story too! I added these banners near the top of my page to create some balance for the right justified journaling. In all it is a simple layout but packs a big punch with color blocking, element clusters, and visual symmetry! Have you used Say Cheese for non-Disney layouts? Life Documented in a Sn@p! Hi all! Kay here, letting you know I love Sn@p! My weeks come together so quickly when I use this line, and the colors just make me happy! To make my life easier, I take out all of my Sn@p! goodies and draw only from those products. The fewer decisions, the more I get done. It's probably why I am still caught up, and have been for the year and a half I've been documenting this way. Here is one week at the end of the school year. I used a calendar card for the dates, and a plain card with a sticker for the week. Here is another week using 99% Sn@p! And I used the following pocket pages for these two weeks. Christmas is only 17 weeks away! Plus I've already got a head start because I was able to create some holiday cards using the amazing new December Documented collection. This release is absolutely gorgeous! The first card I created is more on the traditional & classic side. I used the Red Snowflake/Chevron (Simple Basics) as the background base for my card. Then added a 3x4 journal card, large sticker, brad and some ribbon to complete the look. My second card some of the Blue Snowflake/Chevron (Simple Basics) paper. I just love the combination of red & blue . It's so bright & cheerful. The 3x4 Journaling Cards really add some visual interest & color the front of the card. I also added a few stickers for dimension (by adhering them with foam squares). On the inside of the card I added a few more stickers. My last card makes me smile. There are some super cute sayings & quotes on the 3x4 journal cards and I had to use one of them. Hopefully I've inspired you a bit with your christmas card making for the upcoming holidays. Howdy guys, Layle here, popping in real quick to announce our recent giveaway winners! The random lucky winner from our July Pick a Card, Any Card post - Pat Robertson! 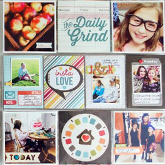 I 'heart' Summer is my favorite card because my scrapbooking club nickname is 'Sweeteart.' The little hearts caught my eye first. I really like it because it can be a journaling card or a mat for a single photo or for 2-3 tiny photos. It's many uses makes it so appealing. I do 'heart' this card. The random lucky winners from our Sketch Magic with Say Cheese post - K in PA and Victoria Ortiz! I just ordered the Say Cheese collection so all I need now is the corresponding book to go with it to complete the layouts for my upcoming Disney trip. Done and done. Thanks for the opportunity to win it! I need this. My kids are upset with me. We went to Disney 3 years ago and still don't have the scrapbook done. I would love to use this product. Congratulations ladies!! Watch for an email from me regarding your prize! Happy Tuesday Simple Stories fans! Tonya here today to share with you a couple of projects featuring the new Smarty Pants line. It's the perfect line to use for all of those back to school photos. Unfortunately my kids don't start school until next week and since I already used last years photos on a previous layout, that meant I didn't have any school photos to use for this project. So, I challenged myself to make a non-school themed layout using Smarty Pants. Take a look below and see just how versatile this line can be. I found some photos of one of my sons' baseball teams and the colors were a perfect fit with this collection! I started with the 12x12 Basics kit and created the sunbursts on the sides, using a little rainbow color scheme. Then I used the Sn@p! Cuts (the orange 3x4 with the cut out start) and stitched around the star and embellished it with a brad. I finished the layout by mixing word stickers in with my journaling and then a sprinkling some chipboard and sticker stars. Next up is a school themed card. I just had to use those chipboard glasses, so darn cute! Hi everyone! Teri here today with a Life Documented project! I'm excited to share with you a couple pages I made recently with elements from Simple Stories' Say Cheese, Smarty Pants and I Heart Summer collections and Sn@p! Embellishments and Sn@p! Cards! It's been a busy Summer around here so I've been really inspired to take a lot of pictures and document what I've been up to fairly quickly. One of my favorite memories this Summer is the night I went to see John Mayer in concert! I get teased a lot by my friends because I've been a fan of his for probably 10 years and have seen him a number of times in concert! This time was extra exciting because I managed to score a ticket for Row D! I arrived at the concert to find that what I thought was a ticket in the fourth row was actuallly in the front row! Talk about exciting! The Say Cheese collection was perfect for documenting this fun night! The "Smiles Ear to Ear" and "Happy" Sn@p! cards pretty much summarize how I felt about the whole experience! I had a lot of great pictures from the concert, but I also wanted to include a few trinkets. The small pockets allowed me to save my ticket, as well as a sticker I picked up at the show! Besides the concert, I've taken part in a couple 5K walk & runs! In fact, I completed two back-to-back just a few weeks ago. Rather than creating two pages for each race, I decided to do one two-page spread with pictures from both events. The left page highlights the first race, which I completed with my dog! The pictures weren't the best so I embellished one of them by adding stickers on it and another by adding more embellishments along the side of the picture. I also included the red hankerchief the race organizers gave Marley, rather than including one more picture on the page. The right page highlights the second race, which I completed late at night with a friend! Once again, my pictures weren't the best so I took creative liberties and added letter stickers right on top of one of them! I tried to bring both pages together by placing a 6x8 Pocket Page between them. It houses the race number for one race on one side, and my race number for the other on the other side. I'll be using the 12x12 Sn@p! leather album in teal as the year goes on for many of my Life Documented projects! I love the color of the album, and that it has a ring binding system! Since I employ a free spirit philosophy when it comes to these pages, I dig that I can easily work on my pages for it out of order. One of the things I love about Simple Stories' Sn@p! leather albums is you can mix and match different sizes of pages together. Sometimes, I don't want to include a 12x12 layout for one little piece fo memorabilia! By the way, I'm using Simple Stories'12x12 Sn@p! leather album in teal as the year goes on for many of my Life Documented projects! I love the color of the album, and that it has a ring binding system! Since I employ a free spirit philosophy when it comes to these pages, I dig that I can easily work on my pages for it out of order. I used the Sn@p! 12x12 Pocket Pages Design 2 (4x6), Design 3 (4x6/3x4), Design 4 (4x6/2x12/3x4) and Design 9 (4x12/3x4/4x6) for my pages today. I also used the 6x8 Pocket Pages. I love the variety of page styles Simple Stories offers. It's fun having so many options. Thanks for tuning in today! I look forward to sharing more of my pages with you soon! Thanks for tuning in today! Wishing you the best Tuesday! I look forward to sharing more of my pages with you soon! I just adore all the fun elements like apples, crayons, pencils and stars in Smarty Pants. But I also love Say Cheese! I guess I just love everything Simple Stories! How about you all? Do you have a favorite or just love them all? Sketch Magic with Say Cheese & a Giveaway! Layle here today with some fun news! Simple Stories and Scrapbook Generation have joined forces to introduce a new exclusive idea book, Sketch Magic with Simple Stories, featuring all-new sketch blueprints that blend perfectly with the unique format of Simple Stories papers and signature elements for quick and creative scrapbooking! Fresh from the popular creative duo at Scrapbook Generation, Allison Davis and Debbie Sanders, Sketch Magic with Simple Stories showcases 18 fun and functional sketches along with 18 beautiful full-color layout examples, all using the new Say Cheese collection. With exact measurements and positions of photos, papers and elements, Sketch Magic is a must-have resource, showing you just how easy it is to create traditional layouts with the innovative Simple Stories products! Well friends, it's now available for purchase here! YAY! Allison and Debbie have created another AMAZING book of sketches and layouts, all using our brand new Say Cheese collection. Allison and Debbie have graciously offered 2 of our lucky readers a book! Simply leave a comment on this post by Monday, August 26th at 11:59 PM MT and we'll draw 2 random comments and announce the lucky winners here on Tuesday the 27th. Hi! Donna here as your host for today. As we sneak closer and closer to September it gets harder to deny that that time of year is definitely upon us. Some of you may have children who have started school already, and for others it will be coming soon. While we homeschool, we still have a first day and all the excitement, anxiety and preparation that goes along with it. Growing up I always loved the start of school and the promise of the new year. There was so much to learn! And I was ready to tackle it all. As a mom, I love seeing that same excitement and enthusiasm in my own children. Today I want to share a layout using my favorite new collection, Smarty Pants. Over the summer my second son took an interest in learning to read. We haven’t pushed him and wanted to let him come to it in his own time. Well, he was finally ready and willing! He doesn’t show his excitement, but every now and then you will see a little smile come across his face as he puts a word together. I love those moments. Smarty Pants is definitely school themed, but there are plenty of embellishments, papers and stickers in this collection for those of us whose children who do not attend traditional school. I love the little “awesome” word sticker in the close-up below. My favorite paper is this one featuring the very same cursive font I was taught as a child. I know I’ll be pulling this paper out again since my oldest will be learning this same cursive style himself this coming year. He's actually excited about this which makes my job a whole lot easier! I happen to love the primary color palette. It probably helps that I have three little boys, but I seem to use this basic color scheme a lot. And I can see using this collection for more than just documenting our school days. What about you? Do you love the new collection? What are your favorite patterns? If you have a moment, take some time to leave a comment; I’d love to hear from you! Simple Stories designs now available with Silhouette!